​Hiking or trekking poles are an outdoor lover's best friend. Wandering in the wilds can be good exercise and a lot of fun, but it isn't always easy. Rough terrain can be challenging to navigate and possibly cause a fall or injuries. 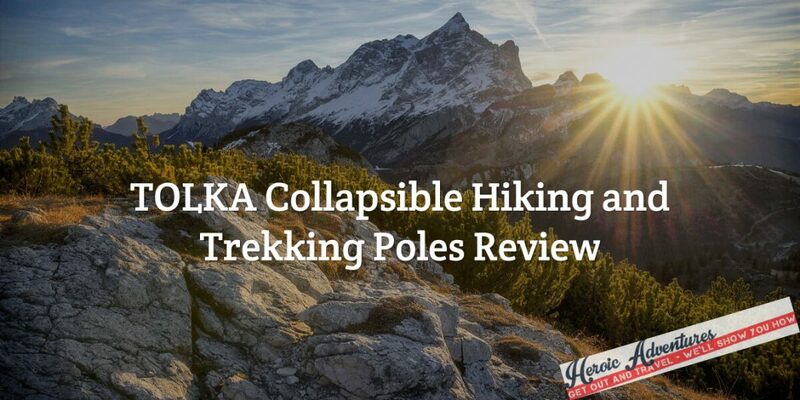 ​TOLKA poles are some of the most popular collapsible poles on the market. Known for their affordable price, these entry-level sticks are often chosen as an alternative to luxury poles like Leki. They're not as light and durable as carbon fiber, but they still give hikers, hunters, fishers, and photographers the advantages of top-of-the-line poles. Aluminum TOLKA collapsible poles extend from 26" to 54.5" and weigh 9.5 oz. And while they only come in black, you won't notice the color once you get on the trails. We heard so many things about these walking sticks that we decided to review them. ​Beginner hikers, photographers, and outdoor fanatics will like the price and quality of TOLKA collapsible trekking poles. They'll be able to get outdoors without the steep costs of other poles. Older adults will be able to walk confidently with a set of these hiking sticks, too. Individuals with their eye on some rugged treks may benefit from a set of TOLKA poles, too. They can use the sticks to prevent falls and injuries, investigate surfaces, and for added stability on steep inclines. They're also ideal for turning a basic walk into a full-body workout. ​TOLKA collapsible hiking poles come in a pair with a nylon travel bag and a set of clips to keep the poles together when carrying or traveling. non-slip, rubber feet for the carbon tips. And, of course these poles come with a quick set of instructions. ​At the top of the TOLKA trekking poles are shaped cork grips. Durable and non-chaffing, you'll find the cork comfortable right from the start, but they also gradually adjust to your grip over time. The grips shed sweat, prevent slipping, and are connected to adjustable straps to ease the strain on your wrists. Below the handle are foam extensions. While not as durable as the cork, you only use them on steep inclines, switchbacks, or terrain changes, so they get limited use and should stand up. The shafts of the hiking poles are made from durable aluminum, and have enough flexibility to absorb vibration, but are sturdy enough to take your weight. To collapse and adjust, these hiking sticks use a tightening screw and quick lock tab system to lock the pole in place. The locking system, along with the measurement marks along the shaft, make it easy and quick to set the poles to the same length. And they stay at the proper height even with intense use. At the bottom of the trekking poles are tungsten-carbide tips. This is where the quality, long-lasting feet attach to the poles. With three different sets, it's possible to use the poles in all weather and on all surfaces with confidence. ​To use the poles, open the quick locks, adjust the length, tighten the screws, and snap the quick locks shut again. Then, put your hands through the straps, lightly hold the grips, and begin to walk. As your right leg comes forward, your left pole moves forward and vice versa. It takes some practice, but there are instructions and YouTube videos if you need more information. ​If these aren't quite what you're looking for, check out Premium Outdoor Gear Ultra Lightweight Trekking Poles. They also come with a cork grip, mud baskets, snow baskets, and non-slip feet. They're foldable and made from super light carbon fiber. The Premium Outdoor Gear hiking poles are 8.8 oz and cost a little less than the TOLKA-brand poles. However, they fold to 14.5" and have an extended length ranging from 45" to 53", which is shorter overall than the TOLKA walking and hiking sticks. ​TOLKA collapsible hiking and trekking poles are fantastic poles for the price. They get the job done, and you won't have to worry that they'll break or give out at any moment. Mount Everest will feel like more of a molehill with TOLKA trekking poles in your hands.